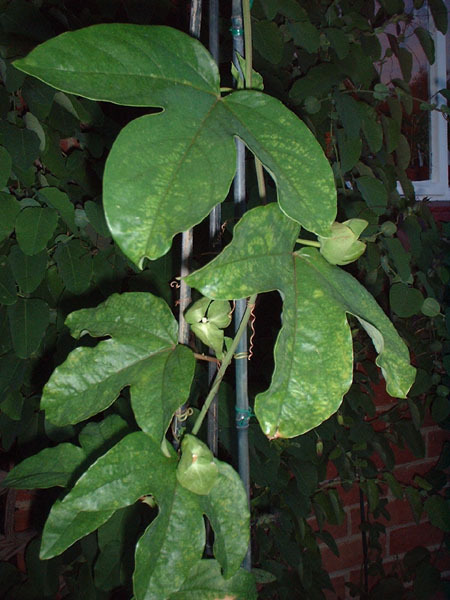 Passiflora are prone to a number of viruses. They include Chrysanthemum B carlavirus, Passiflora latent carlavirus, Passiflora ringspot potyvirus, Passionfruit woodiness potyvirus, & Purple granadilla mosaic virus. Some are introduced by biting insects such as greenfly but others, especially in hybrids propagated by cuttings are in the genes. Their symptoms include leaf distortions, loss of vigour, poor flowering and poor fruiting. Some viruses can weaken the plant enough to kill it. Nutritional deficiencies can look very similar to viral infections and of course are linked in that a plant with a poor nutritional status will be more liable to succumb to viral attack. Note that leaf distortions can be caused by the act of biting alone which disrupts leaf growth. Frost injury may also cause leaf distortions in some plants. 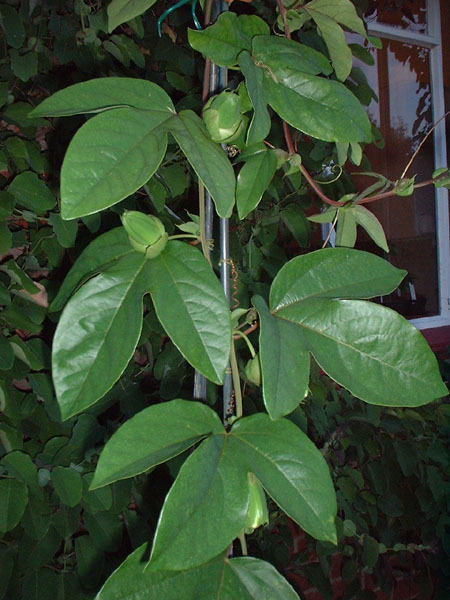 For the amateur gardener my best advice is to feed almost all Passiflora well with liquid or slow release fertilizer throughout the growing season. I say almost because some like P. incarnata does not seem to respond well as it usually grow in very poor soil. Each species and hybrid may be vulnerable to particular viruses only. I have yet to see anything affect P. actinia for example. Viruses are of most concern of course to commercial growers, whether the plants are for fruit production or decorative hybrids. Once an individual plant has a virus it will not get rid of it. Cutting an infected plant back and using the same tools to trim another plant will easily transfer the virus in the sap. Typical damage is as above left in P. x belotii. Note the improvement seen on the same plant above right with regular good feeding. Damage is often most notable at the beginning and end of the growing season. There is anecdotal evidence that when growing quickly the plants can leave the virus further back in the stem and so cuttings can be taken at the height of the growing season to start a new plant without the virus. This would make some sense in that apical meristems (the growing tips) have beeen found to be either free from, or carry a very low concentration of, viruses. Tissue culture of apical meristems often with heat therapy is widely used to to remove viruses from commercially important plants. Of course even if a virus free plant is achieved unless it can be grown in very controlled conditions all it needs is one biting insect for a virus to be re-introduced.